The mezzo-soprano Lilly Jørstad, who has just completed a triumphant run of performances as Rosina at La Scala, has been told that she is ‘unsuitable’ to complete her second year at the La Scala Academy. After last night’s triumphant Barber of Seville alongside Leo Nucci, she was sent a letter saying that the Academy’s teachers had decided not to let her complete her studies. While it is true that she is ‘suitable’ right now for the international platform she has decided – rather like the young Bryn Terfel who studied at the Guildhall School of Music and Drama even though he was already making a name for himself – to perfect some of her stage and vocal technique before being thrown to the lions! After having talked to the Director of the Academy (Accademia di perfezionamento per Cantanti Lirici del Teatro alla Scala), Luisa Vinci, at the beginning of June, she was assured of her place next year, said Jørstad. She didn’t participate in the annual auditions for the final-year students – when they get the chance to show off their wares – which were held from April to June as she was sure to remain in the Academy, and she refused the contracts that she was offered which fell during the next academic year. As a first year student who was chosen for the first cast of Il barbiere at the world’s most prestigious theatre it is assumed that vocally she is certainly not ‘unsuitable’. The curtness of the letter – standard, I imagine – gives no clues to motivation. After the thunderous applause of yesterday’s last performance, Jørstad now feels understandably saddened, confused and also a little desperate. I hear from members of the Barber cast that they are doing their best to lobby for a change of heart and Jørstad has written to Sig.ra Vinci asking for the decision to be reversed. 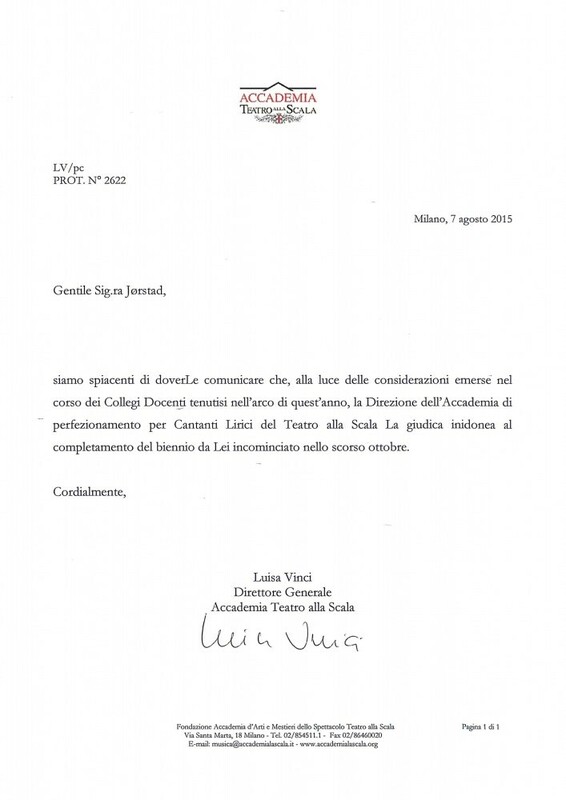 we regret to inform you that, in the light of considerations that emerged during the deliberations of the Teaching Faculty over the last year, the Direction of the dell’Accademia di perfezionamento per Cantanti Lirici del Teatro alla Scala considers you unsuitable to complete the two-year course you started last October. I have heard from many members of the Barber of Seville team (onstage, offstage and below!) who, too, are amazed by this decision after witnessing Jørstad during such a successful run of performances. It should be noted that the Teatro alla Scala and the Accademia are run separately; in fact, it is the theatre that has given Jørstad such an extraordinary opportunity to perform on its stage during these last few weeks. Certainly, Jørstad should be encouraged by the fact that Caballé, DiDonato, Callas and many others have survived negative judgements by audition panels and vocal experts. The ways of committees are indeed incomprehensible at times! You have an informative web page which I hope to visit again.